AHR International can provide a range of fitting tools to suit most staking and swaging requirements. We can provide staking tools across a wide range of plain spherical bearing sizes, including of course common types such as the MS14101, MS14102, MS14103 and MS14104 spherical bearing types. 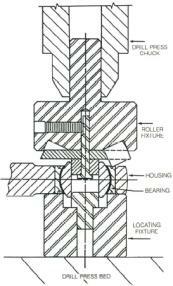 AHR International can also provide tools for unique bearing sizes specific to certain applications.